I have a somewhat uncomfortable relationship with my TV. I don't have cable, and only use the TV to watch movies a few times a month. In fact, until this year I'd never even owned a television! Also, due to the layout of my living room, I don't really have a good place to install a TV. I want it centered between my stereo speakers, not blocking a window or doorway, opposite the couch, and close enough to see. In my living room, the only way to accomplish this is to prop the TV on the coffee table when I want to watch it. As a result, the idea of a hinged-top coffee table with the TV hidden underneath came to mind quickly. However, I wanted the screen to be at a comfortable height when viewing. And, if I was going to build something, I wanted it to be interesting. I had a vague memory of an old black-and-white movie where a boxing glove pops out of a vehicle on a scissors mechanism. 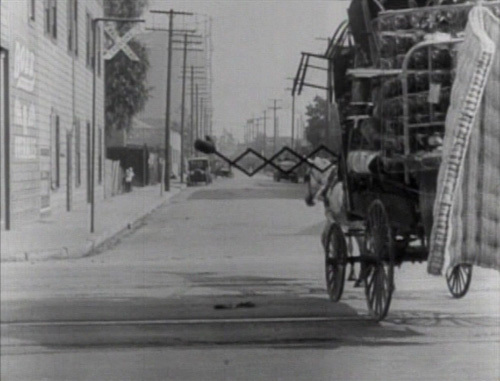 It turns out I was remembering the Buster Keaton movie "Cops", where the glove is used as a turn signal. I love the whimsy of the spindly scissors arrangement, and since I had never done four-bar or other linkage design, I thought this 2D problem would be a good one to start with. I also researched other scissors arrangements. For example, I downloaded the patent for the original Lay-Z-Boy recliner, modeled it in SolidWorks, and studied the motion created by that mechanism. Lift the screen out of the table without hitting anything. Rotate the screen 90° near the top of its travel. Raise the screen to a considerable height (for comfortable viewing and to clear my feet resting on the table). Move the screen forward to prevent the table from toppling backward. Fold flat enough to fit completely inside the table when stowed without the beams hitting each other. Use a relatively vertical load path to ground (the table's frame) in the deployed position, to prevent excessive stress in the mechanism. To build all of these design requirements into SolidWorks, I created a layout sketch with three copies of the same mechanism: fully collapsed, fully extended, and free (for checking the motion by dragging). In this way, I could simultaneously enforce all of my design constraints upon the system while changing my remaining degrees of freedom -- the lengths of the various links, and the positions and types of pivots. If the sum of the lengths of the top two links equals that of the bottom two, the scissors will fold flat. If the sum of the lengths of the links on the left side does NOT equal that of right, the scissors will "bend" as it opens. You can stack scissors to increase deployed height and "bend". Through careful tuning of the lengths of the links, the pivot location, and the height of the slider, I was able to create a mechanism which met all of my requirements. The beams themselves might not be strong enough to hold the television. I've attempted to mitigate this by having the beams loaded in compression only (through the use of pivots), and by making the mechanism relatively "vertical" in its deployed position. The screen might sway left and right while viewing. I'm hoping to reduce this tendency by using very stiff beams and precise pivots. However, if it becomes a problem, a diagonal link might be required. If springs are used on the lower pivot point(s) to balance the screen's weight as the mechanism is collapsed, the resulting forces will be very large in certain positions. This is one of the limitations of this mechanism design. I'll have to run a static analysis to determine whether these forces will become an issue. In addition, there is also the concern that if the scissors are used on both sides of the screen as I'm planning, the two may not stay in perfect sync while the screen is being moved, thus causing it to twist in an undesirable way. However, by connecting the two bottom pivots with a torsionally rigid beam, I'm hoping to mitigate this as well. Currently, I'm considering two construction methods for the mechanism itself. The first is the use of carbon-fiber tubes with machined and anodized aluminum joints bonded to them. The tubes are available commercially and our milling machine is perfect for small high-precision parts like the ends. The second option is to machine the links entirely of aluminum, using FEA to optimize the shapes for minimum weight. The only other major construction decision is the tabletop itself. It needs to be as lightweight as possible, while still being attractive. So I'm currently exploring both wood veneers and enamels on a fiberglass panel. In keeping with my "simple-with-a-twist" sensibility, a friend and colleague at SolidWorks (formerly of IDEO) has done a design study of what the table might look like, which appears at the top of this page.